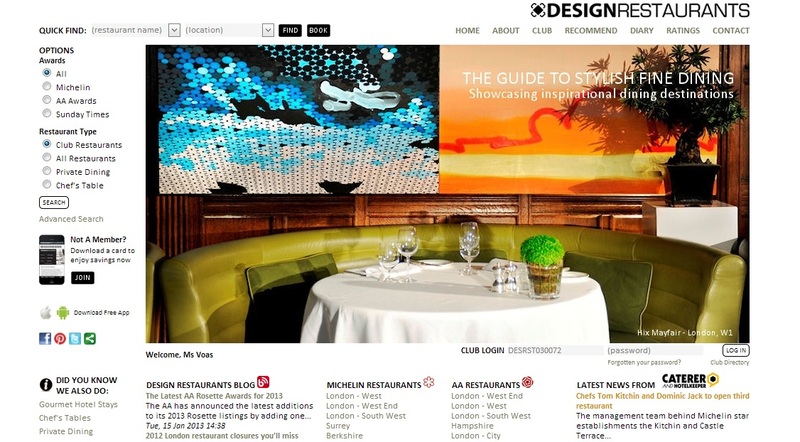 Design Restaurants celebrates the launch of its new luxury restaurant website, unveiled on Monday 11th February 2013, with several striking new features for seeking out the best dining destinations. The new site conveys the company’s quest to showcase inspirational locations in a stylish streamlined format and innovate customer loyalty. At the heart of the new site is its functionality, drawing on each restaurant’s illustrious credentials attained from Michelin and the AA Guides or Sunday Times ranking. Other innovative functions include an innovative Visitor Book where you can tag your visits within a virtual book for each restaurant and store a history of your visits within the members logged in area. In addition you can enjoy daily news feed updates from Design Restaurants proud pairing with the industry’s most respected and longest established publication, The Caterer & Hotelkeeper. Customers seeking the thrill of a Chef’s Table or needing to select a venue for private dining or an important event will find a honed search engine able to sort this effortlessly at the touch of button. The Chef’s Table and Private Dining options will be fully launched from 04th March 2013. Surfing the web to find where to dine, together with exclusive offers for CLUB subscribers to the site, has never been easier than now. Next articleMiscellaneousTop chef declares horsemeat is a "taste everyone likes"!